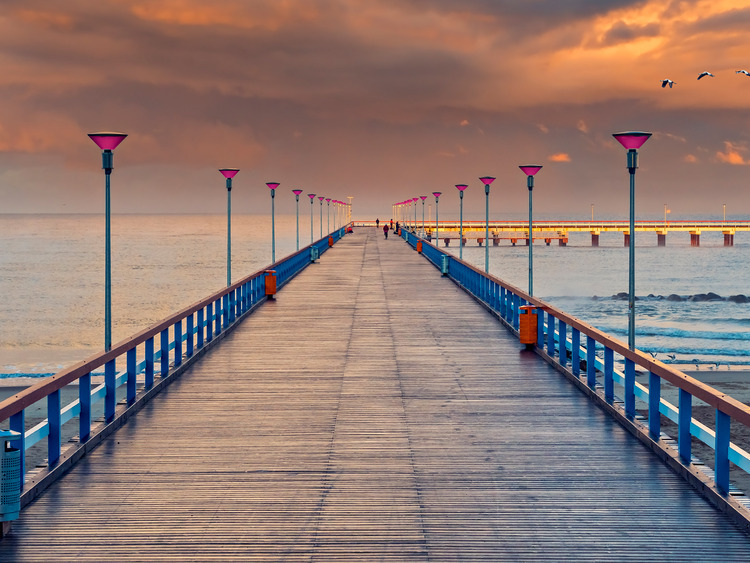 An excursion to discover the fascinating city centre of Klaipeda, the marvels of Palanga's Amber Museum and the lush beauty of the city's Botanical Park. From the port, we drive by coach towards Klaipeda's city centre, where we stroll around and observe the city's fine 18th-century buildings. We stop at the recently restored Theatre Square, which now boasts bright new colours, and here we see Ännchen von Tharau's statue. We then leave by coach for Palanga passing through Klaipeda's residential areas. Our first stop is the Botanical Gardens, built between 1897 and 1907, where we walk among over 200 species of trees and lush shrubs. Also in Palanga, a visit to the wonderful Amber Museum is a must. Founded in 1897 in a Neo-Renaissance building by Count Tiskeviciai, it showcases decorations and jewels made using this resin, which is so precious that is referred to as "Baltic Gold". After admiring the treasures of the museum, it is time for a walk through the palace gardens to the beach. As we observe the lakes populated by swans and other birds, we can easily understand why many people consider this park to be the most beautiful and the richest in fauna in Lithuania. To reach the beach, we pass in front of Birute Hill, where we notice a small sanctuary with a grotto dedicated to the Madonna, commissioned by Count Tiskeviciai's family in the early 20th century. Our excursion ends with a walk along the main street of Palanga which is lined with shops and leads to the famous Sea Bridge. On our journey back towards Klaipeda, we have a last look at Palanga's city centre to ensure that its characteristic charm is firmly imprinted in our memories.